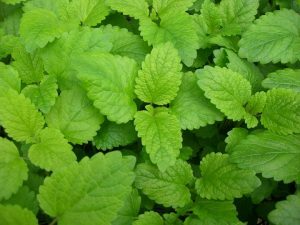 Lemon balm is one of the few sour mints and is cooling and sedative. A tincture of fresh lemon balm is excellent as a general sedative, in particular for those with nervousness, anxiety, insomnia, hyperthyroidism or hyperadrenalism. Lemon balm is a carminative and relieves spasms in the digestive tract. It has a strengthening influence on the heart and circulatory system, lowering blood pressure while simultaneously calming the nerves. Lemon balm has been show to be effective externally against outbreaks of the herpes simplex virus. It’s antiviral properties also help with alleviating colds & flu. Lemon balm is best used fresh, frozen or preserved in alcohol as it loses some of its oils when dried. Make a cream, oil or tincture to help heal herpes sores, burns or dry skin. A poultice of the fresh leaf can help relieve pain caused by cramping and nervous headaches. Use lemon balm fresh in cooking as a substitute for lemon thyme, lemons or mint. Drink lemon balm tea 30 minutes before bed to help with insomnia. The tincture of the fresh herb in glycerine is an effective children’s medicine. Dry your lemon balm to make these teas for later use or use fresh and be sure to cover the cup while steeping to prevent volatile oils escaping in the steam. Combine and prepare as an infusion 3 parts lemon balm, 1 part borage flowers, 1 part chamomile, 1 part lemon verbena and 1 part St. Johns Wort. This infusion is relaxing and gently stimulating. It increases energy in the system by helping release energy blocks and stress. Combine and prepare as an infusion 2 parts lemon balm, 1 part feverfew and 1 part lavender. Drink 1/4 cup every 30 minutes until the headache is gone. If made into a tincture, take 1/4 teaspoon three times daily. Women’s Tonic Tea – Refreshing and nourishing tonic. Combine and prepare as an infusion 2 parts lemon balm, 2 parts nettle, 2 parts mint, 2 parts raspberry leaf and 1 part milky oats. Drink 3 to 4 cups daily. With its lovely flavor, lemon balm can be used to make an herbal honey. Chop lemon balm leaves coarsely and pack into the bottom of a glass jar. Pour honey over them until topped by an inch of honey. Make sure all plant parts are submerged and cover with a lid. Check on the jar every day, making sure that all of the herb is under the honey. Fresh lemon balm has a high water content and will go bad if exposed to air. You can try wilting the lemon balm for a day on the counter before making the honey. After about a month, you can strain out the herbs, or leave them in the jar if you prefer. Use your herbal honey on scones and freshly baked bread, and in tea. The honey preserves the medicinal benefits of the lemon balm. Try making an herbal honey with both lemon balm and thyme. Delicious together, and medicinal too – lifting the spirits and supporting the respiratory system. Cautions/Contraindications: None. Lemon balm is extremely safe.